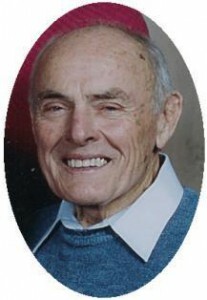 Frank Hensel, 82, of W Grand Avenue died at his residence surrounded by family on Sunday, September 10, 2006. He was born in Rinnen, Germany on March 9, 1924 to Franz and Barbara Baumeister Hensel. In October, 1927 when Frank was three the family immigrated to the United States and settled in the Port Washington area. He attended Port Washington Public Schools. He served in the Army during World War Two in Company B of the 1252nd Engineer Combat Battalion. After returning from the war he met and married Lucy Gasser of Port Washington on September 25, 1948 at St. Mary’s Church in Port Washington. Frank began working at the Wisconsin Electric Power Plant in Port Washington in 1950. He was a tinsmith and mechanic for 36 years, retiring in 1986. He was a member of the Employees Mutual Benefits Association and the International Association of Operating Engineers, Local 317. Frank enjoyed spending time at the trailer on Castle Rock Lake the family owned. He enjoyed boating and water skiing and in the winter, snow skiing. He also enjoyed woodworking, making whimsical furniture and outdoor crafts and was a former member of the Ozaukee County Barbershoppers. He is survived by his wife, Lucy, daughter Kriss (Ken) Streblow of Brownburg, Indiana and two grandchildren, Kelly and Kurt Streblow. Further survived by sister Emily Zankl of the Town of Port Washington, sisters-in-law Mary Schultz and Ann Steig, brothers-in-law Ray gasser and Joe (Jean) Gasser, nieces, nephews, other relatives and friends. Preceded by a brother Karl Hensel and four sisters, Barbara Schnitzer, Elizabeth Bscherer, Francesca Hensel and Elsa Gaertner. The Rev. Allan Sommer will officiate funeral services 7 pm Thursday, September 14, 2006 at the funeral home. Entombment St. Mary’s Cemetery, Port Washington. Visitation 4 – 7 pm Thursday at the funeral home. Memorials appreciated.